These days Atlanta homes are selling quickly and buyer competition can be tough. That’s why at The Family Mortgage Team in Atlanta, we stress to our clients the importance of getting pre-qualified before ever going to even look at a home! And with homes today having multiple offers, most of the time a simple pre-qualification isn’t enough to seal the deal. 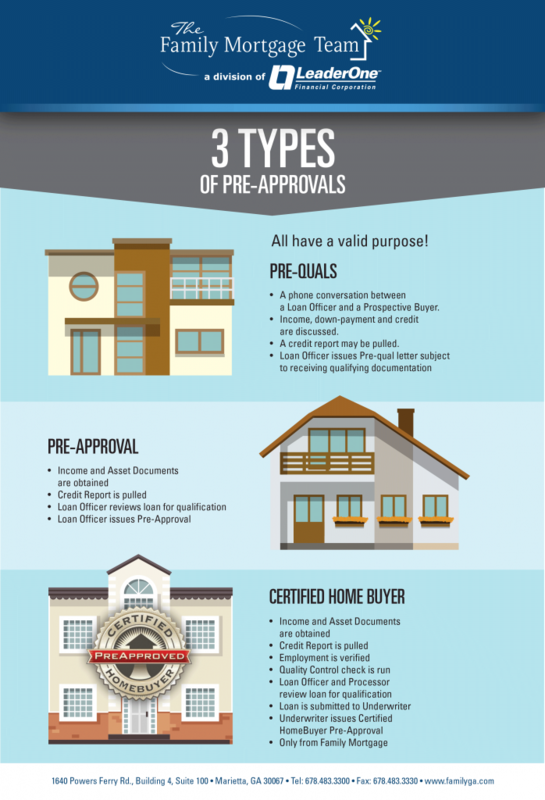 Below we explain the 3 types of pre-approvals; Pre-Qualification, Certified Homebuyer, and Pre-Approval. One of which being the best pre-approval on the market; Certified Homebuyer. A Certified Homebuyer is the strongest pre-approval you can get, only offered by The Family Mortgage Team, and can be viewed by the sellers as the equivalent to a cash-offer on a home! Check out the difference between Pre-Qualifications, Pre-Approvals, and become a Certified Homebuyer. If you have more questions about today’s market and getting pre-approved for home in Georgia or Florida, call us at 678-483-3300! Having Trouble Getting Your Offer Accepted?